In 40 years of Vancouver Canucks hockey, the team has seen its share of players and staff. Some donned a Canucks sweater for a year, others a decade and a select few were with the organization their entire careers. Wayne Maki, Larry Ashley, Gary Lupul and Luc Bourdon all spent time in Vancouver, time that was, tragically, cut short prematurely for all four extraordinary individuals. During Tuesday night’s game at Rogers Arena between the Canucks and Philadelphia Flyers, these Canucks family members will be honoured for leaving a lasting mark on the club. Their lives ended too soon, but they will forever be Canucks. Larry Ashley went to work at age 19 for the WHA Ottawa Nationals and followed that franchise to Toronto and Birmingham. For 16 years Ashley was a head trainer in the National Hockey League. 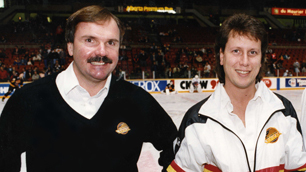 The last 14 years of his career were spent with the Canucks, where he supervised and coordinated all medical aspects for the team, both on and off the ice, before he passed away following a valiant battle with cancer. 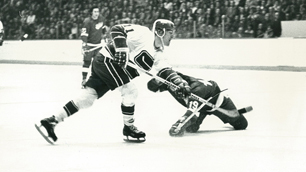 From Legends of Hockey – Lupul signed as a free agent with the Canucks in 1979. The local product was a part-time player for the Canucks for four seasons and became a crowd favourite at the Pacific Coliseum. In 1982, he scored five points in ten games as the club reached the Stanley Cup finals for the first time in franchise history. “He was a very Europeanized Canadian. Very agile, good hands, good vision, maybe not predictable but that was an advantage because you couldn’t calculate what he was going to do. Very nice guy, friendly, very warm hearted and funny, a very funny person. A great guy to be around, he for sure made a mark. 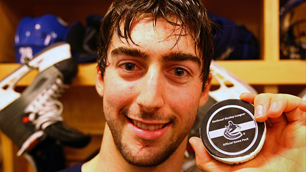 Luc Bourdon first emerged onto the national stage and into the hearts of the Canucks family when the then 19-year old was drafted 10th overall in 2005 after impressing Canucks management with his raw ability as a member of Val d’Or of the QMJHL. 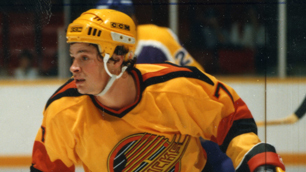 Bourdon played 36 games in Vancouver, scoring two goals, before he passed away in a motor vehicle accident at age 21.